Today i will be teaching you guys on how to use SP Flash Tool to flash MediaTek devices custom/stock ROM. MediaTek also means MTK , when someone says his/her phone is an MTK ,he/she also mean MediaTek . and MediaTek is one of the leading mobile IC manufacturer. And some lists of MTK Android phone are ,Tecno,Infinix,Oppo,Innjoo,Gionee,Itel,Oppson and many others. Now back to SP Flash Tool , when you talk about flashing Custom or Stock ROM of an MTK smartphone , the first tool that rings a bell is SP Flast Tool, because it's user friendly and has been designed for MediaTek device to help Flash Custom ROM, Unbricking of Bricked smartphone , Installing custom recovery and firmware update. Below are the steps to Flash Stock ROM using SP Flash Tool On your PC. SP Flash Tool , Download it Here. Android ABD Drive, Download it Here. Custom or Stock ROM that you want to flash on you phone , make sure you download the exact ROM of your smartphone , you can get a few smartphone ROM here. USB cable to connect you smartphone to your PC . NOTE THAT: Do not flash another preloader and DSP_BL blocks , it is always harmful! on some models of smartphones you will have a brick even if you downloads these blocks read from a phone which you own . Always remove fromthem marks SPFT. Always have a working backup of your original ROM before you flash a new unknown ROM. Also Nueltech will not be responsibly for any harm incurred while you attempt this. Be safe !! Disconnect your phone if it is connected with USB to your Computer , and turn the phone OFF completely , also remove the battery if possible (ignore this step with those phone tht has inbuilt battery). Now connect the USB cable to the phone with the Computer while the phone is till off , Window should pop up and begin to install the MTK65XX preloader Drivers , this only happens if you installed the MediaTek Preloader USB Driver correctly in Windows. After complete installation , disconnect the USB cable again. Now Extract SP Flash tool on your Computer and launch it. 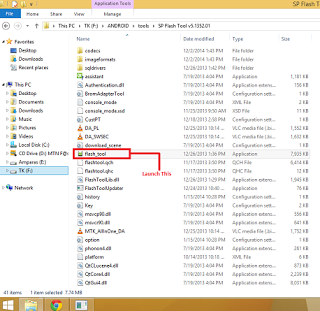 Open the folder you extracted it to and locate flash_tool , double click on it to open it. Once it is launched , click the Scatter-loading button. Locate the scatter file in the backup or ROM of the phone that you downloaded .It is usually a text file ( Note: Always load a ROM that is 100% only made for your phone ,flashing wrong ROM may cause your phone to be non-bootable). Now Hit the "Download button in SP Flash Tool to begin the flashing process. Connect your phone to the computer with a USB without battery in it ,if possible to remove. Press , Vol Down or Up so that the computer can easily detect the phone . Once flashing is completed you will see a green circle confirmation , with Download OK.
Now Close the SP Flash Tool and disconnect your phone from the computer . Congratulaion your phone is now flashed with the new Custom ROM . If your phone Bootloops , just remove your battery and boot into recovery mode , Factory reset the phone.